July is the 35th anniversary of 1977’s The Spy Who Loved Me. It may not be the best James Bond movie but it’s certainly one of the most important for the series: 007 got his license to kill renewed. 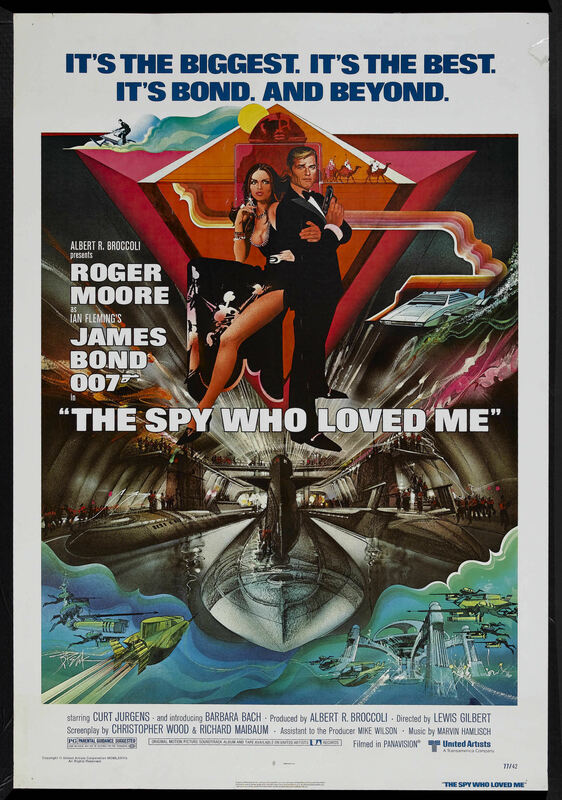 A preliminary version of Spy’s poster: Barbara Bach is “introduced” while Michael G. Wilson gets a credit he wouldn’t receive on the final version of the poster. Spy faced many barriers to reaching the screen: the breakup between founding 007 producers Albert R. Broccoli and Harry Saltzman; widespread doubt (outside of Bond fandom) whether Agent 007 had a cinematic future; and legal fights as Kevin McClory sought to get back into the 007 movie game more than a decade after 1965’s Thunderball. All of those topics have been covered in more detail than we can provide here. Suffice to say, there was a lot riding on the 10th James Bond film. Eon Productions was now headed solely by Cubby Broccoli, aided and abetted by stepson Michael G. Wilson (who got a “special assistant to producer” credit in small type in the main titles). United Artists had bought out Saltzman’s stake in the franchise. The studio (now, in effect, Broccoli’s partner) supported the remaining Bond producer by doubling down, greatly increasing Spy’s budget compared with 1974’s The Man With the Golden Gun (about twice Golden Gun’s $7 million outlay). For star Roger Moore, it was his third 007 film. It firmly established him in the role and he has said it’s his favorite Bond movie. The plot has a number of similarities with 1967’s You Only Live Twice, also directed by Lewis Gilbert. Spy had a tanker that swallowed up submarines where Twice had an “intruder missile” that swallowed up U.S. and Soviet spacecraft. The script was developed after a number of writers participated without receiving a credit (among them, Anthony Burgess; Cary Bates, then a writer for Superman comic books; future Animal House director John Landis; and Stirling Silliphant). The final credit went to 007 stalwart Richard Maibaum and Christopher Wood (the latter, who got top billing in the screenplay credit, was brought in by Gilbert). There even were odd changes in the early version of the film’s poster compared with the final version. For all the twists and turns, Spy was a big hit in the summer of 1977. It generated $185.4 million in worldwide ticket sales, the highest-grossing 007 film up to that point. (Although its $46.8 million in U.S. ticket sales still trailed Thunderball’s $63.6 million.) The movie also received three Oscar nominations: for its sets (designed by Ken Adam, aided by art director Peter Lamont), score (Marvin Hamlisch) and title song, “Nobody Does It Better” (by Hamilsch and Carole Bayer Sager). The movie, though, went 0-for-3 on Oscar night. Do all 007 film fans love Spy? No. Check out some of the comments by HMSS EDITORS, many of whom never warmed up the Roger Moore movies. Still, Spy’s success ensured there would be future 007 screen adventures, securing Broccoli’s control of the franchise. Eon Productions put out a news release last year saying that Morgan would join Neal Purvis and Robert Wade in writing Bond 23. In the Indie Wire interview, which you can view for yourself starting around the 3:20 mark of the following video, Morgan says he “wrote a treatment, I never wrote a script…I went there with an orignial idea.” He never mentions Purvis and Wade. Eventually, the financial troubles at Metro-Goldwyn-Mayer Inc., which controls half of the Bond franchise, caused Morgan to cease his efforts, which he clearly doesn’t seem sad about. The fate of Bond 23 won’t be decided until MGM’s future is resolved. — Prestige apparently means more to current Eon boss-people Michael G. Wilson and Barbara Broccoli than it did to master showman Albert R. Broccoli, Eon’s co-founder with Harry Saltzman. Broccoli relied on Richard Maibaum, at least for first drafts, while Saltzman tried to entice more prestigious scribes, such as Paul Dehn (on Goldfinger) and John Hopkins (on Thunderball) to revamp Maibaum’s early drafts. Deighton also did some work on From Russia With Love, according to U.K. film historian Adrian Turner, and Burgess was among a gaggle of writers that pitched ideas for The Spy Who Loved Me. But the old Eon seemed to keep it all in perspective (i.e. they didn’t let the search for presige bog down the screenwriting process) than the current crew. — Morgan sounds like he was never highly interested in the world of 007. You half expect him to sound like Sebastian Faulks, author of a 2008 Bond continuation novel, that it might be a jolly good romp to try writing a Bond movie. — This is another case why press releases shouldn’t be viewed as any more than the tip of an iceburg. We conclude our comparison of James Bond films to the Ian Fleming originals. We’ve gotten a mixed reaction. While some like the analysis, there’s also a worry that these entries reinforce fan like/dislike of particular actors. The Spy Who Loved Me: The official story, told time and again, is that the deal Eon Productions made with Fleming is that only the title of the author’s novel could be used. That’s understandable. Bond doesn’t appear until two-thirds of the way through and the story is told from the perspective of a young woman who has had her share of troubles in life. The movie Spy, from all accounts, was the first time Eon retained the services of a tag team of writers, including future director John Landis, author Anthony Burgess and DC Comics writer Cary Bates. The final script was credited to Christopher Wood, director Lewis Gilbert’s choice, and 007 veteran Richard Maibaum. It’s a virtual remake of You Only Live Twice (also directed by Gilbert). In a documentary on the film’s DVD, we’re told that superthug Jaws was inspired by Horror, a thug in the novel who wore braces. The film ended up being a bit hit and re-established 007 as a popular movie figure at a time many critics wondered if he was washed up. A View To a Kill: The movie is viewed by some fans as yet another remake of Goldfinger. But the Richard Maibaum-Michael G. Wilson script seems to channel John Gardner’s continuation novels as much as Fleming, including a scene set as the Ascot horse-racing track, also featured in Gardner’s License Renewed novel. That’s somewhat amusing given how Wilson has badmouthed Gardner’s novels, including at a 1995 fan convention in New York City. Then again, you can’t copyright locations, and as a result, you don’t have to pay royalties and rights fees. GoldenEye: Bond returned to movie screens in 1995, six years after his previous film adventure. Once more, Eon brought in multiple writers. Three got some form of credit: Michael France, Jeffrey Caine and Bruce Feirstein. One, Kevin Wade, didn’t, though he managed to have a CIA operative (played by Joe Don Baker) named after himself. The film also launched the seven-year tenure of Pierce Brosnan as Bond. Tomorrow Never Dies: If it worked once (bringing in several writers), it can work again, or at least that seemed to be Eon’s approach to Pierce Brosnan’s second 007 outing. Novelist Donald E. Westlake was among those employed at least at one point. Westlake’s involvement might have gone unnoticed except the author told an Indiana audience that he would be writing the film. That was news to Bruce Feirstein, standing next to Michael G. Wilson, when Wilson was asked about Westlake’s comments during a 1995 fan convention in New York City. The film ended up with a “Written by Bruce Feirstein” credit but that was misleading. Other writers were brought in after Feirstein submitted a draft. Feirstein was summoned to finish things up as the film faced tight, frantice deadlines to ensure a Christmas 1997 release. The World Is Not Enough: by 1998-1999, Eon’s approach to film writing was well established: bring in enough writers and you can develop a workable story. This time, it began with Neal Purvis and Robert Wade, with Dana Stevens (wife of director Michael Apted) playing midwife and Bruce Feirstein finishing things up. All but Stevens would get a credit. Quantum of Solace: The most recent 007 movie follows a familiar pattern. The Purvis and Wade duo worked on the project at one point. Paul Haggis did the heavy lifting as the project faced a Writers Guild deadline for a strike. Another screenwriter, Joshua Zetumer, was brought in for final polishes. Haggis got top billing in the eventual writing credit followed by Purvis and Wade, with no mention of Zetumer. The film was a big hit, though some fans wondered if the movie was too heavily influenced by the Jason Bourne movies. There were few critques suggesting the film had too many Ian Fleming influences.